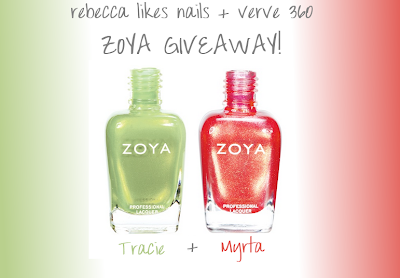 rebecca likes nails: Verve 360 Zoya Giveaway Winner! Hey everyone! This is probably the fastest giveaway result announcement ever - it only ended 22 minutes ago! There weren't too many entries to go through so it was easy. As a reminder, here's what a lucky reader is about to win! Tracie and Myrta from Zoya! Again I'd like to thank Verve 360 hair salons in Pittsburgh for allowing me to have this short-and-sweet giveaway! I deleted the comments that did not count as entries and that left me with 87 potential winners. Laura! Congratulations Laura, I'm about to email you to get your mailing address! Thank you for entering, everyone! If you didn't win this time, never fear! I have another giveaway coming up very soon, I'm just waiting for a prize in the mail! And there will be three winners... Lots more fun to go around! yay! I can't wait to get these pretties on my fingers! Congrats Laura!! These are some pretty colors!